Planing long board edges is just what holdfasts are ideal for. The great thing about holdfasts is that they can be installed anywhere you can drill the hole for them to jam in, in this case in the bench apron. 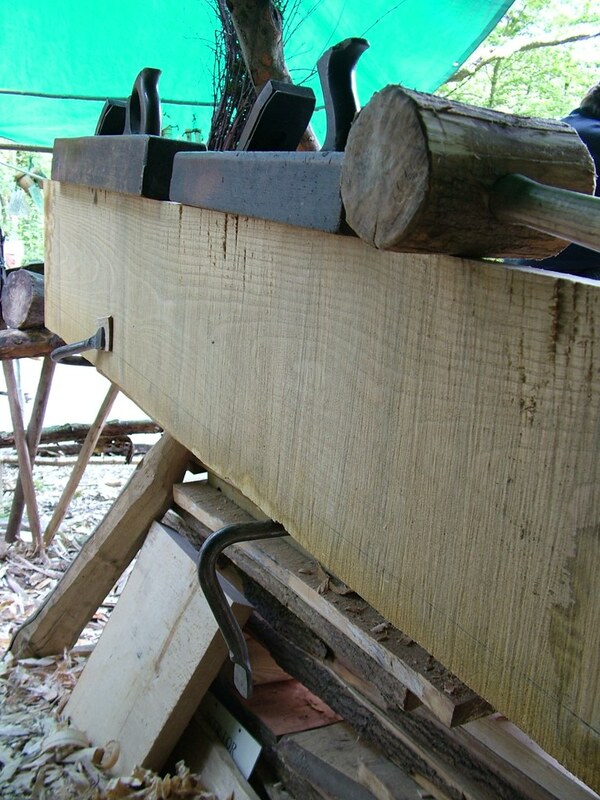 Much quicker than making a leg/shoulder vice and support pegs in a leg. The other advantage is that the holdfasts support the board before you’ve tightened them up, as you can see in the photo one is fastened up and the other is just in the hole supporting awaiting my turning it and tightening it up with the mallet. I also got two old wooden planes set up to work. I’d been struggling with these for a while, one problem being that the jointer had a bent cap iron so the shavings were constantly getting stuck between it and the plane knife. I bought a second-hand cap iron, it’s 2 1/2 inches wide which seems to be a bit unusual now, and no new cap irons that wide seemed to be available. That solved the shavings problem. The other problem I had was setting the thickness of cut. I watched a very instructive video by David Finck on Fine Woodworking and realised that I was jamming the wedge in far too hard. I’ve started using a little gavel I made a while ago and the planes are much more manageable now – and the bonus is no more blisters on the side of my right hand from the metal plane I used to use. This entry was posted in Appropriate technology, Green woodwork, hand made and tagged holdfast, wooden plane by Flying Shavings. Bookmark the permalink. Great to see those lovely wooden planes being used – I’ve got loads of them but rarely do any planing.